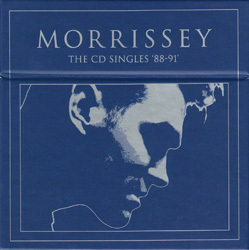 The box set contains Morrissey's first 10 cd-singles released by EMI in the UK: "Suedehead", "Everyday Is Like Sunday", "The Last Of The Famous International Playboys", "Interesting Drug", "Ouija Board, Ouija Board", "November Spawned A Monster", "Piccadilly Palare", "Our Frank", "Sing Your Life" and "Pregnant For The Last Time". Compact discs are found in slipcases instead of the original thin jewelcases. Click on titles above for more information about the original releases and their respective artwork. A second box set of cd-singles, this one covering the years 1991-1995, was released later in the year. For more information, see "The CD-Singles 91-95" box set. All the material from these two box sets was released in 2009 on a 3-cd set titled "HMV/Parlophone Singles '88-'95". A special EMI promo cd was sent to retail for instore play. 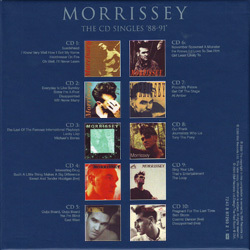 It featured 17 songs from this box set and its companion "The CD-Singles 91-95". An EMI various artists promo cd intended for radio featured one song from each box-set.